Donald Trump (left) and Megyn Kelly. 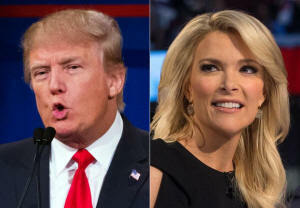 NEW YORK (AP) — Fox News chief Roger Ailes said Tuesday that Donald Trump owes the network’s Megyn Kelly an apology for an unprovoked Twitter attack that ‘‘is as unacceptable as it is disturbing,’’ but Trump isn’t backing down. The Republican presidential front-runner-turned-TV-critic had welcomed Kelly back from a vacation Monday night by tweeting that he liked her show better while she was away. Trump said Kelly ‘‘must have had a terrible vacation’’ because ‘‘she’s really off her game.’’ He retweeted a message that referred to her as a bimbo. That led to a private, clear-the-air conversation between Ailes and Trump two weeks ago, but that clearly hasn’t led to peace. In his tweets, Trump repeated his contention that Kelly, host of a prime-time Fox show and one of the network’s biggest stars, was sent on an unplanned vacation that ended Monday. Fox said her time off had been scheduled long before the debate. Trump also tweeted that Kelly was afraid to confront a guest, Dr. Cornel West, and that she had ‘‘no clue’’ on immigration. I liked The Kelly File much better without @megynkelly. Perhaps she could take another eleven day unscheduled vacation!
. @megynkelly must have had a terrible vacation, she is really off her game. Was afraid to confront Dr. Cornel West. No clue on immigration! "@mstanish53: @realDonaldTrump @megynkelly The bimbo back in town . I hope not for long ." In addition to Roger Ailes, several of Kelly’s Fox News colleagues came to her defense on Tuesday. Hosts Bret Baier and Sean Hannity took to Twitter to call on Trump to end his attacks on Kelly. Remember how Donald Trump attacked Megyn Kelly because she dared to ask him tough questions and how tiring it was? Well, he's at it again! Brian Kilmeade said on ‘‘Fox & Friends’’ that Trump’s comments bothered him personally.